With Live 10’s Capture feature, you need never lose a great MIDI idea again! Simple in its implementation and execution, but nothing less than a creative life-saver, Live 10’s new Capture function enables you to instantly recall every MIDI note recently played at the click of a button, even when the transport is in stop mode. Yes, that's as reassuring a feature as it sounds, so let's see how it works. 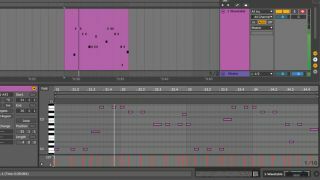 Get more Live 10 tutorials in the February 2018 edition of Computer Music. Step 2: Oh no… we forgot to hit the record button! But not to worry - behind the scenes, Live 10 listens to the input from all currently armed MIDI tracks. When we punch the Capture button (the square ‘crosshairs’ button) up in the top transport bar, the notes we just played magically appear in a MIDI clip on the timeline. Step 3: We can now head into the MIDI clip to quantise notes and expand upon our initial idea. Capture isn’t a new concept in the DAW world - FL Studio has had the less excitingly named ‘Tools > Dump score log to selected pattern menu’ command for many years now - but it’s good to see this potentially lifesaving feature as a part of Live.